This article is about the Australian electronic duo. For the cartoon characters, see Itchy and Scratchy. Itch-E and Scratch-E are an Australian electronic music group formed by Paul Mac (a.k.a. Itch-E, Mace) and Andy Rantzen (a.k.a. Scratch-E, Boo Boo), both on keyboards and samples, in 1991. During the late 1990s the duo recorded as Boo Boo & Mace!. At times, they have included a third member, Sheriff Lindo (a.k.a. Nutcase) which were recorded as Boo Boo Mace 'n' Nutcase. In 2001 they disbanded as Mac pursued his solo career. In 2010 the duo reunited as Itch-E and Scratch-E to release new material. In 1991 Itch-E and Scratch-E were formed in Sydney by Paul Mac (as Itch-E) on keyboards and samples (ex-Smash Mac Mac, The Lab) and Andy Rantzen (as Scratch-E) also on keyboards and samples (ex-Pelican Daughters). Their name refers to United States carton show, The Simpsons' characters, Itchy and Scratchy, as well as the drug, ecstasy or E. According to Jody Macgregor of AllMusic the name "certainly suggests that the idea of forming a techno duo started as a laugh." The duo were often joined for live shows by Sheriff "Dub Man" Lindo. They initially performed a techno sound which drew on early bleep techno as well as influenced by fellow Sydney-based, Severed Heads (Tom Ellard of that group had helped produce an album by Mac's earlier band, The Lab, which was never released). The melodic influence of Mac, trained in classical music, gave them a distinctive sound which eventually led to pop success. One of their demos led to the band signing with Volition Records' label, Second Nature. Their debut mini-album, Irritable, was released in August 1992. The group released the album Itch-E Kitch-E Koo in October 1993. It was recorded at two Sydney studios, The Lab and Masking Tapes, with Mac and Rantzen as producers. Kristian Hatton of Haarp Media, in July 2015, listed the album as one of his Top 100 Albums in Niche Electronic Music, and explained "[it] showed that electronic music in our country – although always influenced by America and Europe – could gain attention from a mainstream audience despite being from the underground." The lead single from the album, "Sweetness and Light", was released in 1994, and was co-written with Justin Brandis (of Pelican Daughters). It became their best-known work, and peaked at #65 on the ARIA Singles Chart. At that time grunge was more popular than rave music: "grunge was introspective and depressive, rave was quite the opposite. It was still gritty, but its core message was utopian: peace, love and unity." The track was listed in twenty-first place on the Triple J Hottest 100, 1994. At the ARIA Music Awards of 1995 they won the inaugural Best Dance Release category. When Mac accepted he declared "We'd like to thank all of Sydney's ecstasy dealers, without whom this award would not be possible." Although this was bleeped out of the TV broadcast, a sponsor of the awards, the National Drug Offensive, withdrew their funding. In 1996 Itch-E and Scratch-E released the album Itch-E and Scratch-E... and Friends, which Australian musicologist, Ian McFarlane, described as a "sprawling double album... which covered the gamut of electronic dance." According to McFarlane the friends appearing on the album included Crackerjack, a "high energy house" duo (with Mac); Event Horizon (comprising Lindo and Rantzen) which provided "funky bleeps"; Alien Headspace's "electronic jazz"; and Lindo's "hypnotic dub". They also released a single-only, "Howling Dog", which was nominated for Best Dance Release at the ARIA Music Awards of 1996. By the end of that year they had to change their name to Boo Boo & Mace! due to international acts of similar names. As Boo Boo & Mace! the duo issued a studio album, Sublimely Pointless, in July 1998 on Prozaac Recordings. More than a year earlier they had released a CD single, "Flowers in the Sky" in February. At the ARIA Music Awards of 1997 it was nominated for Best Dance Release. With Lindo aboard, as Boo Boo Mace 'n' Nutcase they issued a single, "Gotta Move On", in November 1997. Additional singles by Boo Boo & Mace! followed in 1998. By 2001 the duo had reverted to Itch-E and Scratch-E and released another studio album, It Is What It Isn't (1 May 2001), but they disbanded in that year with Mac pursuing his solo career. In January 2010 the duo announced on their MySpace page that they had reformed as Itch-E and Scratch-E. During that year they released another studio album, Hooray for Everything!!! (6 August 2010), and four singles, "Other Planets" (March), "r.E.f.r.E.s.h" (May), "Electric" (October) and "Back 2 the Jack" (December). Hooray for Everything!!! peaked at No. 23 on the ARIA Dance Albums chart. In 2015, "Sweetness and Light" was listed at number 1 in In the Mix's '100 Greatest Australian Dance Tracks of All Time' with Nick Jarvis saying "Paul Mac and Andy Rantzen's greatest track symbolises the turning point when the previously underground rave scene suddenly stepped into the mainstream consciousness." Credited as Boo Boo & Mace! McFarlane, Ian (1999). "Whammo Homepage". Encyclopedia of Australian Rock and Pop. St Leonards, NSW: Allen & Unwin. ISBN 1-86508-072-1. Archived from the original on 5 April 2004. Retrieved 10 April 2012. Note: Archived [on-line] copy has limited functionality. ^ a b c d e f g h i j k l McFarlane, 'Itch-E & Scratch-E' entry. Archived from the original on 30 September 2004. Retrieved 12 November 2015. ^ a b c d Macgregor, Jody. "Itch-E & Scratch-E | Biography & History". AllMusic. All Media Guide. Retrieved 12 November 2015. ^ Hatton, Kristian (26 July 2015). "Haarp Media's Top 100 Albums in Niche Electronic Music – Ver. 1". Haarp Media. Retrieved 13 November 2015. 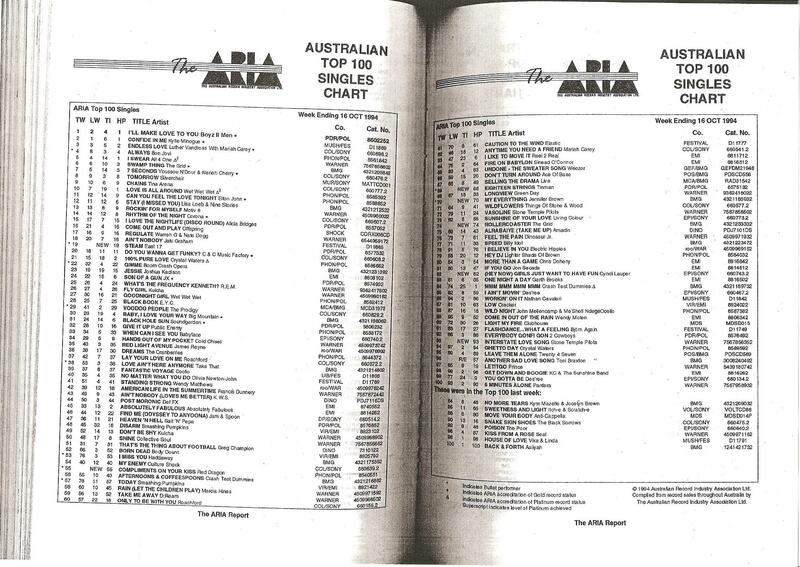 ^ a b "The ARIA Australian Top 100 Singles Chart – Week Ending 16 Oct 1994". ARIA. Retrieved 22 March 2016. ^ Knox, Troy (6 May 2014). "Australian anthems: Itch-E & Scratch-E – Sweetness and Light". The Guardian. Retrieved 13 November 2015. 1995 winners and nominees: "Winners by Year 1995". Australian Recording Industry Association (ARIA). Archived from the original on 26 September 2007. Retrieved 13 November 2015. 1996 winners and nominees: "Winners by Year 1996". Australian Recording Industry Association (ARIA). Archived from the original on 14 December 2007. Retrieved 13 November 2015. 1997 winners and nominees: "Winners by Year 1997". Australian Recording Industry Association (ARIA). Archived from the original on 22 December 2007. Retrieved 13 November 2015. ^ a b Jenkins, Jeff; Meldrum, Ian (2007). Molly Meldrum Presents 50 Years of Rock in Australia. Melbourne, Vic: Wilkinson Publishing. p. 230. ISBN 978-1-921332-11-1. ^ Swales, Kris (2010). "Interview: Itch-E and Scratch-E: Everything Starts with an E". SPA Summer Festival Guide. Archived from the original on 12 March 2011. Retrieved 13 November 2015. ^ "The ARIA Report" (PDF). Australian Recording Industry Association (ARIA). 9 August 2010. p. 17. Archived from the original (PDF) on 11 August 2010. Retrieved 29 June 2015. ^ "The 100 Greatest Australian Dance Tracks of All Time". 2015. Retrieved 22 March 2019. This page was last edited on 24 March 2019, at 00:41 (UTC).